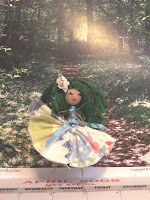 My handmade flower fairies and their friends. Here's my latest fairy. Isn't she a cutie? She was sent to a pal in the US as part of my first Craftster swap. Instead of the usual silk flower petals, her skirt is made from fabric strips which were leftover from a fabric flower pin that I also included in my pals swap package. Check out my main blog for more information about the swap and links to various tutorials & free patterns. BTW, check out the background photo. It's part of a calendar from the Isle of Man (that I also sent). I think the fairy looks quite at home there! I started blogging in April 2006. I'm a true craftaholic and I enjoy knitting, crochet, sewing, spinning and felting. I have a special relationship with my handmade felt.